Dabbling with a relatively new form of picture taking called “straight” photography, Paul Strand captured the image of an unsuspecting New York beggar in his photograph titled Blind Woman. Using the “straight” technique, Strand focused his shot directly at the woman in her natural setting. He thus refused to tamper with her position or stage the image whatsoever. As a result, the blind beggar is captured in a very realistic and objective way. 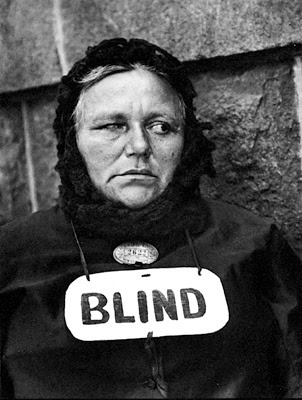 Ironically, Paul Strand used a deceptive photography technique in order to snap a picture of the blind woman without her knowledge of it. This is rather odd since the woman cannot see in the first place and would not be able to notice Strand taking the picture regardless of his position. Whether he was uncertain as to if the woman was actually blind or not may have attributed to this trickery, for the image would have been ruined had she noticed him. In addition to the “straight” feature of this image, an aspect of cubism is incorporated, for several basic shapes are distinguishable. This includes the rectangular stones making up the wall as well as the rectangular “blind” sign, the oval license fastened to the beggar’s shirt, and the woman’s circular face. By embracing a “straight” style in Blind Woman, Paul Strand exposes the simple, more realistic vision of New York. While many artists and photographers portray New York as a glamorous city comprised of bright lights and behemoth skyscrapers, Strand accomplishes the feat of illustrating the city’s poverty and struggle. Although the woman does not appear to be begging in the picture, her license pinned above the sign reading “blind” was used to signify legal begging in New York at this time. Furthermore, this small pin helped keep track of the city’s beggars. The blind woman appears to be looking to her left, with her right eye mostly closed, despite the fact that she cannot see. This may be the result of a medical condition, however it is uncertain. Even though Strand’s photograph is that of a poor, blind beggar, much of the sympathy that would be felt for this woman is eradicated by the close proximity of the shot. The image is focused more on the expression of the woman and the objects that signal her struggle rather than the action of begging and the setting of the impoverished place she resides in. Moreover, this image does more to capture the culture of a beggar than the sadness and poverty of one. Strand therefore succeeds in exposing a culture of New York that is not often accounted for. Unlike most of the photographers of his time, Paul Strand began taking photographs more for the objectivity of them than for the infusion of deep meaning. While one could infer that the woman’s hardships and handicaps could relate to those of the Jews, he really just desired to create simple images that were visually appealing in themselves and that did not have to be symbolic. He moreover strayed away from the norm and was able to capture visual significance and artistic simplicity in Blind Woman. This is a thoughtful and well-written discussion of Strand’s photograph of “Blind Woman.” I think you’re right that Strand wanted people to see what they had previously ignored and recognized the power of photography to call attention to someone or something. Here he is calling attention, even as he is also letting us see people who don’t know that we’re looking at them. It would have been good if you had included a couple of the other portraits he did in this year to get a sense of where Blind Woman stood in relation to these other photographs. Blind Woman becomes iconic because it confronts us powerfully as a good portrait does. We don’t need to know anything else about the woman except what we see (and your analysis of the photo’s components is very good). It is very different from the portraits that Lewis Hine took that were meant to spur us into action to change conditions for the poor and exploited. Missing in this post is any discussion of Strand as a Jewish photographer. I agree with your assessment that he is not photographing the woman out of any sympathetic understanding. But if that’s the case, then where does Jewishness enter the story?